Two thousand years ago, a joy unlike any the world had ever heard was announced. In the most unlikely of places, to two of the most unlikely of people, a Son was to be born. Announced by angels and witnessed by shepherds, the Prince of Peace had come to give light to men, and a cosmic shockwave has been ringing across the earth ever since. The first Christians called this announcement “good news” or gospel. One of the most amazing things about this gospel is that even after 2,000 years, when people hear this message, things happen. People change. Families transform. Joy is found. At South Valley Community Church it is our mission to repeat this message. We repeat the sounding joy of the good news of Jesus Christ, any way we can to whomever will listen. In light of this incredible mission, I’ve seen our church family working diligently to tell of His good news. Every week we gather in dozens of small groups and various ministries, and come together for six Sunday services in English and Spanish, all to carry out His Mission. I am so proud of our church. We are educating and caring for the poor and vulnerable in Tanzania and Nigeria. We are feeding the elderly in Cuba. Here, we have families taking up the challenge of fostering children. I am proud of our discipleship, I am proud of our leaders, and I am proud that we love the Bible and take it seriously. I am so proud we are striving to be a Gospel-Centered and Mission-Focused community. The truth is, we live in the least churched area in the country which presents new challenges. Our culture is in desperate need of the Good News of Jesus and we need to be more prepared than ever to articulate His truth. By God’s grace our church is growing, but the mission of the church in this Silicon Valley culture is daunting. We feel God calling us to grow and expand our reach and influence to minister to the people God loves so dearly. We also feel that God is calling us to add more campuses in the next few years. This is a moment of opportunity! 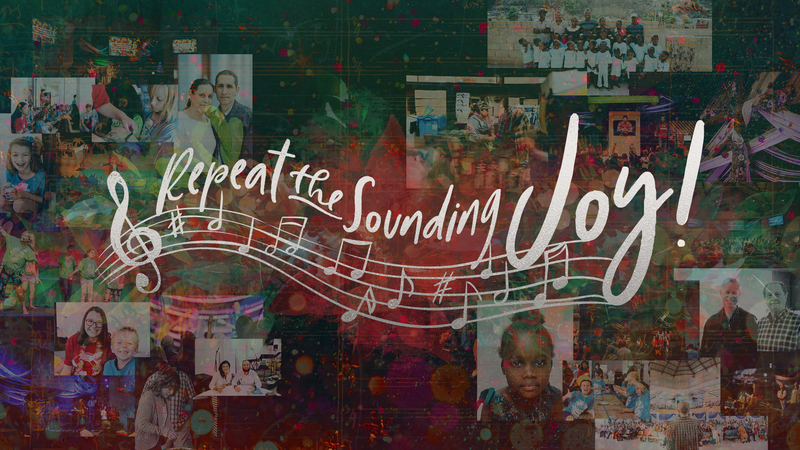 Our “Repeat the Sounding Joy” year-end giving opportunity allows us to expand and grow our ministries at all of our campuses. This year our goal is $200,000 above normal contributions. Most nonprofits rely on 25% of their financial support coming in the month of December, so we greatly depend on this further generosity. You can make a donation by giving on Sunday, mailing a check to the church office, or give online. For these gifts to be tax deductible this year, they must be postmarked or hand delivered no later than December 31, 2018. Our Mission is Huge! But our God is bigger. When His people faithfully serve and give, Christ is treasured and our earthly resources go to expanding God’s Kingdom. The world needs hope, and our mission is to give people the hope that can only be found in Jesus. The Gospel is good news, and we want this news to resound throughout the world. May we all do our part and repeat this sounding joy. 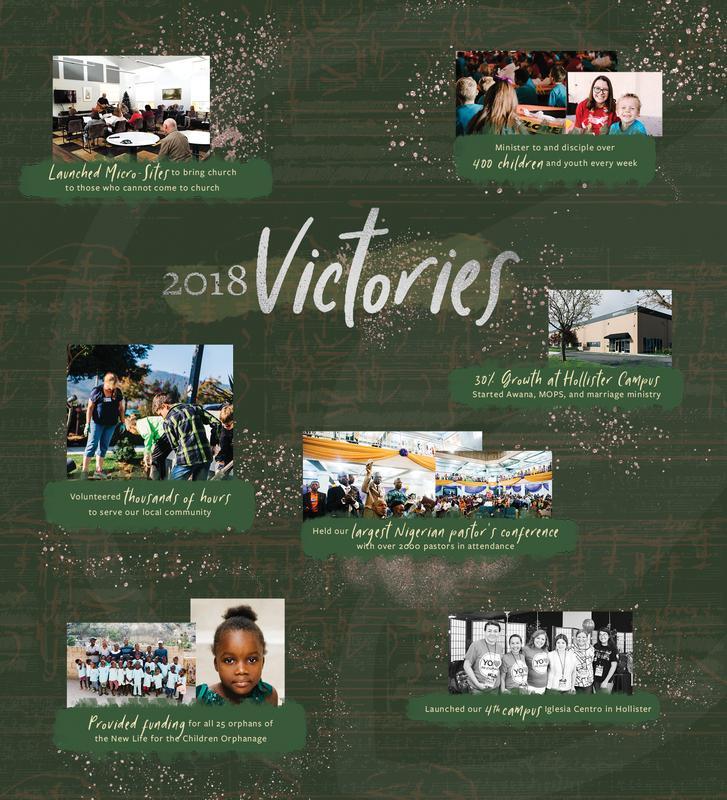 Help us prepare ourselves for an exciting 2019 by prayerfully considering an end-of-year financial gift. Blessings to you as we enter into the Christmas season.